All of our food is made to order. Please allow extra time during peak hours. Choose from our homemade dressings: Buttermilk Ranch, Italian, Honey Mustard, 1000 Island, Sweet & Sour. | Add hard boiled egg, cheese or extra dressing for $0.50 each item. Leaf and iceberg lettuce mixture with carrots, cabbage, onions, cucumbers, tomatoes and croutons. Top it off with one of our homemade dressings. Leaf and iceberg lettuce, carrots, cucumbers, red cabbage with chopped ham and turkey, bacon, hard boiled egg, tomatoes, croutons and shredded cheese. Top it off with one of our homemade dressings. Leaf and iceberg lettuce topped with diced applewood smoked bacon, chopped tomatoes, shredded cheddar cheese and croutons. Served with our homemade ranch dressing. Leaf and iceberg lettuce, carrots, cucumbers, red cabbage with bacon, pineapple chopped chicken and croutons. Served with our homemade honey mustard dressing. Seasoned ground beef with melted cheddar, lettuce, tomatoes and served in a crisp baked tortilla shell with jalapeno ranch, sour cream and salsa on the side. Fresh baby spinach, bacon, sliced almonds, hard boiled egg, button mushrooms and croutons, served with sweet and sour dressing. Chicken salad served on a bed of lettuce with tomatoes, dill pickles, hard boiled egg and choice of two side dishes. Choice of corned beef or turkey with Swiss cheese, thousand island dressing and coleslaw on marbled rye. Lean roast beef with melted provolone cheese on our fresh baked roll served with au jus on the side. Sliced chicken with melted Swiss cheese, applewood smoked bacon and BBQ sauce on ciabatta. Hot Italian ham, hard salami, pepperoni and provolone cheese with lettuce, tomatoes, onions and hoagie sauce on ciabatta. Smoked ham with Swiss cheese topped with lettuce, pineapple and honey mustard on ciabatta. Rotisserie style chicken, applewood smoked bacon and pepper jack cheese with chipotle mayo and lettuce on ciabatta. White meat chicken salad, sliced almonds, applewood smoked bacon, lettuce and tomatoes on ciabatta bread. Mesquite smoked turkey, applewood smoked bacon, pepper jack cheese, red onions and raspberry chipotle sauce on grilled jalapeno cornbread. Honey ham topped with melted Swiss and cheddar cheeses with mayo/dijon blend, dill pickles and onions on grilled ciabatta. Choice of corned beef or turkey with melted Swiss cheese, thousand island dressing and sauerkraut on grilled marbled rye. Grilled and seasoned chopped steak with lettuce, tomato, mayo, grilled onions and provolone cheese on a French roll. Layers of Swiss and cheddar cheeses, fresh basil and tomato on grilled wheatberry bread drizzled with honey. Baby spinach, carrots, cucumbers and tomatoes with a herbed cream cheese and colby jack on wheatberry bread. 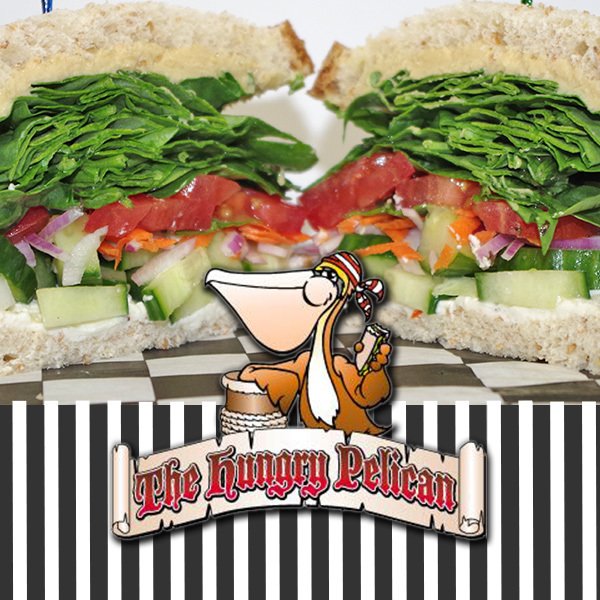 Hummus, herbed cream cheese, hoagie dressing, baby spinach, red onions, carrots, cucumber and tomatoes on wheatberry. Served on ciabatta bread with lettuce, tomato, mayo and applewood smoked bacon. Double meat: Add $2.75. Served on a sub roll with chips and a pickle... Also available: wheatberry, marbled rye, white bread and flour wrap. Jalapeno cornbread: Add $1.00. | Choose condiments: mayo, Dijon, onion, lettuce, tomato, hoagie sauce. Cheese: Imported Swiss, Cheddar, Provolone, Pepperjack, Smoked Gouda, American, Mozzerella. Add $0.50. Dietz and Watson all beef quarter pound hot dog served on a sub roll with choice of ketchup, mustard, onions, relish, coleslaw and sauerkraut. All sandwiches on white bread with Scooby Snacks, applesauce and choice of milk, juice box, water or small drink. Served in 8 ounce cups.